The 18th Annual Starnet Design Awards, one of the most respected and influential commercial flooring design competitions in America, were held on April 15, 2016 in Miami, FL as one of the major highlights of Starnet Worldwide Commercial Flooring Partnership’s Annual Meeting, April 14-16. The awards recognize creativity, professionalism, quality and versatility, and this year’s winners encapsulated the power of innovative and bold flooring installation in commercial interior design. From a critically acclaimed, environmentally conscious airport project to the renovation of a national treasure that plays host to astronauts and space-flight enthusiasts, the projects had judges and competitors seeing stars. The most prestigious award, the 2016 Grand Prize, was presented to Starnet Member Resource Colorado of Denver, CO for their work at IMM TI. The installation at the Boulder, CO based digital agency also captured the Gold in Corporate. IMM TI is a brand driven by data, digital technology and culture. The full-service agency needed a space that reflected its personality as a forward-thinking, modern and youthful company but also provided a zen-like balance through the integration of greenery and blend of interior and exterior design elements. This project was selected as a winner because of the balanced combination of materials that resulted from this vision, along a well-edited approach. The overall aesthetic was an industrial, neutral palette to which the flooring team added pops of color in the carpet, the greenery, and specific paint locations in order to align with the client’s professional but playful persona. A variety of collaborative and individual workspaces were integrated into the plan to support a range of staff work styles. 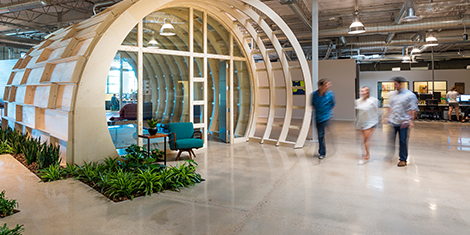 Built-in “nooks,” standing height touchdown spaces and informal “living room” style meeting areas were all key factors in designing for company productivity, flexibility and staff satisfaction. 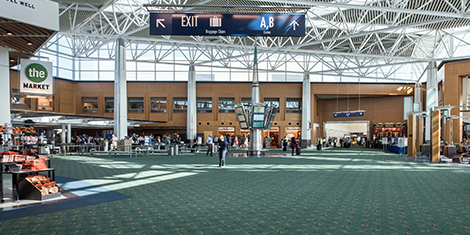 The Gold in Environmental Achievement was awarded to Rubenstein’s Contract Carpets LLC for their work on the Portland International Airport (PDX) Terminal Recarpeting. The project, which gained national attention through coverage in the Wall Street Journal, Smithsonian, New York Times, and on NBC Nightly News, was done over ten months in a fully operational airport. It saw the complete removal, reclamation and replacement of 14 ACRES of carpeting, in an airport that was known for its iconic carpet pattern. The environmental story at the Portland Airport goes beyond recycled content, sustainability, and LEED points (even though those were important factors). 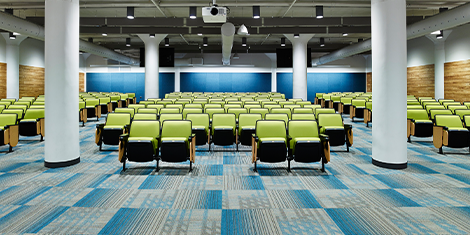 This project was all about the direct reuse of 14 acres of used carpet, without additional processing and direct recycling into carpet pad. Rubenstein’s Contract Carpets LLC was able to re-purpose and upcycle many of the products into entry mats, area rugs, wall art, Christmas ornaments, community center carpet, flooring for a renovated a 100-year-old building, baseball practice hitting facility, etc. In addition, the company recycled the balance of the material into a variety of materials, and all scraps of the new carpet (in excess of 2-feet) were saved and have been given to a vendor to make entry mats and area rugs for resale. This year’s Unique Installation Challenge prize was awarded to Mr. David’s Flooring International, LLC for its work on a true national treasure. The Kennedy Space Center’s Astronaut Encounter on Merritt Island, FL recently underwent a total system reboot. The dated complex, which includes a lobby/holding area, theater, gallery and corridors, was given a thorough refresh, and a futuristic new look promises to keep visitors enthralled for years to come. While some areas required simple modifications, the newly redesigned 1,500 square-foot lobby and 4,000 square-foot theatre were a complete redesign and rebuild. 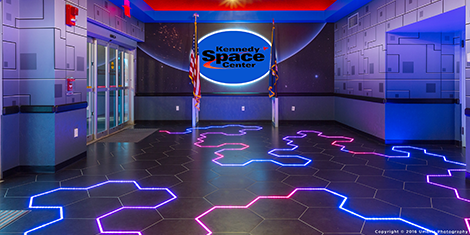 Along with new theatre carpet flooring and wall carpeting, the lobby included black hexagonal tiles with an integrated LED programmed light show. Starnet Member Mr. David’s Flooring International, LLC was also awarded the Gold in Healthcare and the Gold in People’s Choice for their work at the Rush University Medical Center Pediatric Intensive Care Unit in Chicago, IL. Born out of the idea that sick children often look down at the floor (instead of up at colorful wall graphics and images in the pediatric ICU) Mr. David’s and Designer Proteus Group worked with doctors, nurses and a worried father to create a flooring solution that was both inspirational and provided a sense of escape from the reality of a very serious healthcare setting. Divided into the ICU’s four quadrants, the installation includes images of Spring, Summer, Autumn and Winter, all unique to the Chicago area. From Spring’s budding trees and dragonflies to Summer’s beach balls and footprints in the sand, the flooring motif led to Autumn’s falling leaves and footballs, and finally arrived at Winter’s frozen puddles, snowmen, and hockey sticks. The floor has since become a tool of healing for all ages. Soothing colors and gently flowing shapes encouraged very young children to find peaceful distraction, while still creating “find the flying kite” or “seek the sun” walking games for school-aged children who realized that they had recuperated enough to walk again. 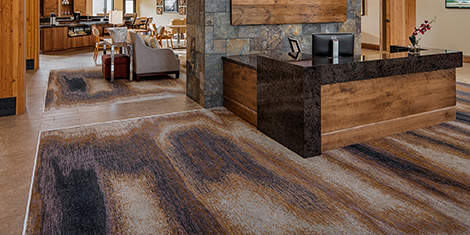 As the center of a multi-layered visual program, the flooring imagery interconnects the various images of Chicago’s seasons on the walls, at light sconces, on patient boards, and even at room signage stations throughout the Unit. 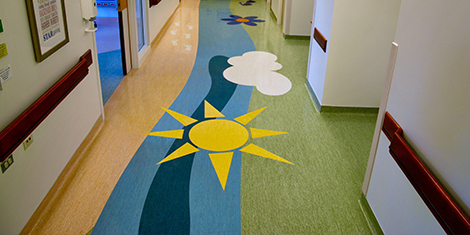 The highly successful flooring design has been credited for bringing a cheerful, healing environment with many layers of visual interest for all ages, one-time patients or frequent flyers, the medical/nursing staff, and the patients’ families. This happy consequence highlights how looking down can truly start the healing process towards lifting a patient’s spirits, one fallen leaf at a time. The winning projects were selected by a panel of nationally recognized and award-winning A&D professionals, including Paul Lewandowski, AIA IIDA LEED AP – Lavallee Brensinger Architects, Design Principal; Scott MacMeekin, IIDA LEED AP BD+C – Gensler, Associate; and Megan Walker, ASID LEED AP – Eppstein Uhen Architects, Senior Interior Designer. Honorary Judges for the Environmental Achievement and Unique Installation Challenge Awards were Robert Peoples, Ph.D, Executive Director of Carpet American Recovery Effort (CARE) and John McGrath, Director of INSTALL, respectively. 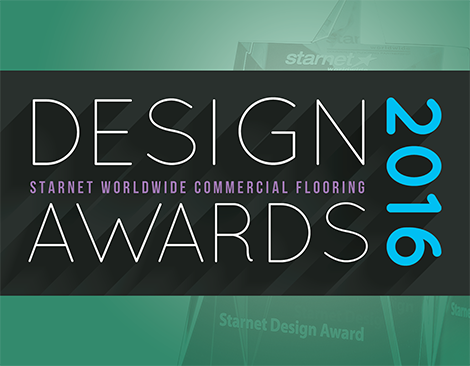 To view all the 2016 Starnet Design Awards entrants and winners, please visit http://designawards.starnetflooring.com/gallery/.